It takes as little as 2 inches of water and 2 seconds for a child to drown. Do your Neighbours have kids? Where are these Kids now? Do I need a pool alarm? Most accidents and deaths take place whilst the child is being supervised by a parent. In majority of cases the child was out of sight for less than 5 minutes (the time it takes to make a cup of coffee). Most of the victims are under 5 years old. Most of the family’s that have lost a child end up in divorce. Drowning’s and near drowning’s even occur in pools with perimeter fencing and gate alarms. DO YOU HAVE A POOL SAFETY ALARM? Vigilance is the best way to prevent a child from drowning. But can anyone be vigilant 100% of the time? In the USA more than 300 children a year under the age of 5 drown in residential swimming pools. There are times when even the best parents take their eyes off their children for a minute or two. Without any warning, at any time, an accident can occur. Most pool mishaps happen in less than five minutes; the amount of time it takes to make a cup of coffee or a sandwich. There are tools that can help you promote pool safety. Pool safety alarms afford you extra protection for the ones you care about and love. They will help keep your children from becoming a statistic. TYPES OF POOL SAFETY ALARMS There are various models of alarms to consider depending upon your budget, type of pool, and technical requirements. GATE ALARMS: Gate alarms are mounted directly on your pool’s gate with two magnetic switches. These alarms, which are battery powered, activate when the gate is opened and the electrical field is broken. There is an override button that can be pressed by an adult to allow them to pass through without sounding the alarm. Gate alarms are designed for outdoor use, come in many different sizes, are inexpensive, and easy to install. The disadvantages of these devices includes they are battery powered, possess no audible low battery indicator, and have no DC power adaptor. 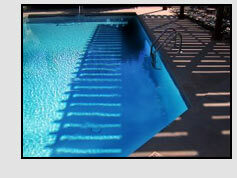 DOOR ALARMS: Door alarms are designed for pools that include the house in some part of or in their entire perimeter. When the door is opened an audible alarm sounds. These alarms, which are turned on and off using a key or a keypad, are either battery powered or use the home’s current. They are affordable, easy to install, and provide a warning if the door is opened. They are also useful in detecting intruders. Disadvantages include the fact that they can be unintentionally left off, the pitch of the alarm may be limited, and when adults and supervised children are entering the pool they must be turned off. Additionally, if you have a doggy door the alarm is compromised because children can crawl through the smaller door. WINDOW ALARMS; As with door alarms, window alarms are used if the house is included in some part of or in the entire perimeter of the pool. When the window is opened an audible alarm sounds. These alarms, which are turned on and off using a key or a keypad, are either battery powered or use the home’s current. They are affordable, easy to install, and provide a warning if the window is opened. They are also useful in detecting intruders. Disadvantages include the fact that they can be unintentionally left off and the pitch of the alarm may be limited. If you have security grills on your windows these alarms are unnecessary. PERIMETER ALARMS; These alarms, which use laser or infra red light, form an unbroken beam of light around the pool’s perimeter. When someone entering the perimeter breaks the beam the alarm sounds. Alarm beams are positioned 12 to 24 inches above ground level and should be adjusted according to your child’s height. These devices, which are the most expensive on the market, give total perimeter protection at a set height. Disadvantages are that the set height may not suit visiting children and that the alarm will activate if one of the pool’s perimeter alarms is inadvertently hit, moved, or covered. WRIST ALARMS These versatile alarms, which are the latest in water safety, may be used at the pool, in a boat – anywhere there is fresh water. These waterproof devices are key locked securely onto your child’s wrist and communicate via a base station. When the wrist alarm is immersed in water the station alarm is activated. Base units and wrist alarms are purchased separately, which means you may have numerous wrist alarms for one base station. The wrist alarms have become very popular. To outfit three children the cost would be approximately $250. Some disadvantages are that they must be on your child’s wrist 24 hours a day to be totally effective, separate units must be purchased for visitors to ensure their safety, and they do not function in salt water. VOICE ALARMS; These talking wireless security systems are like having your own sentry on duty 24 hours a day. With multiple uses– pool, business, campsite – these all-weather devices set up quickly and possess a long range. Triggered by movement, when the in-home unit is activated you’re alerted by your personal recorded message. Two to three sensors, each with its own message, can be used per in-home receiver. These cover a 140 square yard area and instantly inform you when children have entered the pool area. 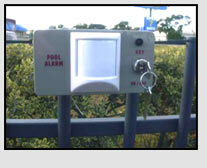 FLOATING/WAVE SENSORS; These in-pool alarms are mounted on the edge of the pool or in the pool. They are key activated, battery powered, and portable. Generally these alarms sense water displacement when an object weighing more than fifteen pounds enters the pool. When this occurs a signal is sent to a remote receiver which is either in the home or carried by the adult. The receiver emits an alarm of approximately 85 decibels. These alarms can be used with pool covers or solar blankets and have an adjustment that can reduce their sensitivity. They are affordable with most models priced around $300. The disadvantages to this system include the portability, which means they can be removed, and the fact that someone must be in the water before you are alerted. FENCE/ WALL MOUNTED PASSIVE INFRA-RED MOTION DETECTORS; This all weather-designed system may be mounted on a pool fence or wall and can also be installed in a spa, patio, or garage. They protect an 8-yard semi circular area by emitting a 110-decibel alarm that can be heard up to 50 yards away. These alarms, which are most effective when mounted on a pool fence or wall, are armed one minute after being switched on and possess a 5 second entry delay feature which prevents the device from going off immediately after it’s been activated. Unique features include both a movement and heat sensitive sensor that can only be activated by a small child or animal when performing movements and emitting body heat within its patrol range. 2 standard alkaline batteries or a DC power adapter run these alarms, which have a 12-month full replacement warranty. Price is around $340. Things to Think About In considering a pool safety alarm one should compare features, price, and reliability. Consider the power source or sources, the fail-safes, and the potential for inadvertently disarming the warning system. Remember that pool alarms are one tool that will help to make your swimming area safer. Parental guidance and vigilance are primary in insuring pool safety. This is an investment in your family’s future. Losing a child is devastating and most couples who do so end up in divorce. Statistics are cold hard facts; the hug of your child is a tender, heart-warming reality. Keep your little ones safe and protected.